More about Marimekko Unikko Blue Mug Start your day the playful way by drinking your fresh brew from this Marimekko Unikko Blue Mug. The Oiva porcelain is just right for daily indulgence, as it is microwave, oven, freezer and dishwasher safe. 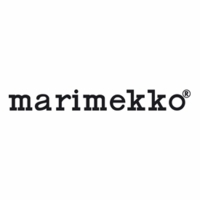 Marimekko dinnerware is freezer, microwave, oven and dishwasher safe. I love Marimekko and wanted this mug for a while. Yellow/lime color is so cute and cheerful. Just looking at it makes me happy. Very pretty mug! I don't like to see its made in Thailand. 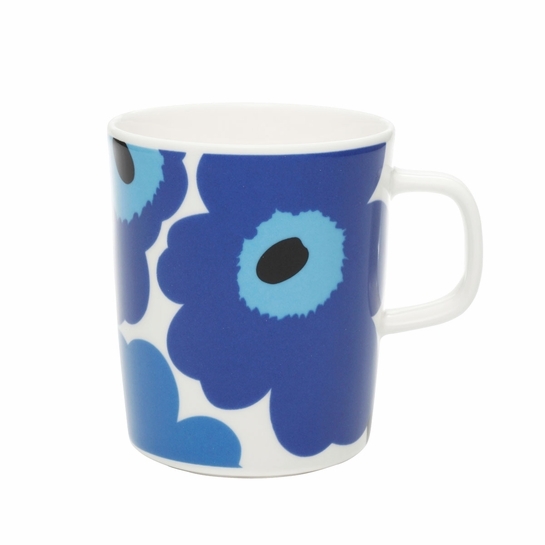 This is wonderful addition to our Marimekko mug collection! I have several of these Unikko mugs and this goes great with the rest! I use this to drink my french press coffee from at least once a week. Great on its own or as a set with other colors! Love the design and weight of this mug. Beautiful mug will add more beauty to my Marimekko pear mugs. Beautiful! I've have known and used all these product for the better part of my life and am still impressed by the quality and beauty of these mugs! you can't beat the great design and great quality of marimekko and this poppy mug is no exception! I ordered this classic marimekko mug for a friend. What more is there to say? It is a classic! As with the red ones I also got, the surface is nice and smooth. The colors are as pictured. I got these for my daughter, who has several blue Marimekko patterns, now she wants the red ones, too. The materials are smooth and as brightly colored as the photo. The handle is a good size for the size of cup. Easy to grasp. Beautiful mug. We have four colors and enjoy using them. Love these mugs, they are so pretty. Delivery was really fast. Received them with 2 weeks. ProsEasy to order. Didn't have to even leave home. These mugs are super durable and fit in your hand so perfectly, don't scratch or stain and are so cute!! Love the vibrant blue. These mugs are super durable and fit in your hand so perfectly, don't scratch or stain and are so cute!! Love the pop of red it's so cheerful. These mugs are super durable and fit in your hand so perfectly, don't scratch or stain and are so cute!! I love the pattern and style. These mugs are super durable and fit in your hand so perfectly, don't scratch or stain and are so cute!! Wakes up any shelf - and me! I absolutely love these mugs and am planning to buy more. They are the right size - not too big and not too small. I highly recommend them! First time dealing with this company. Has been a great experience. ProsIt fits 3 different sizes of cups from my Keurig machine! I bought these mugs in red and blue a couple of years ago and we love drinking our coffee out of them. We like the size and the marimekko design. So glad I purchased them from FinnStyle! Love the colors of this perfectly sized mug; great coffee tastes even better when enjoyed from this mug. Love the style and design of this cup. Perfect to start with morning coffee and great to share with a family and friends. Loving my mugs, they look super-cool in my kitchen! Even makes my coffee taste better too!